This past Shabbos marked the third and final In-Shabbos for talmidim in Rabbi Mendelson’s Junior Shiur. In preparation for their bechina on the beginning of the the sixth Perek of Bava Kamma, the entire Shiur spent Shabbos together in yeshiva. 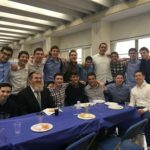 The In-Shabbos kicked off with Mishmar Madness on Thursday night, which set the tone for the entire Shabbos. After a beautiful Carlebach Kabbalas Shabbos and seudah, talmidim began their chazzarah in YU’s Glueck Beis Medrash. Chevrusahs learned together, while Rabbi Mendelson served as a Shoel Umeishiv. At 11:00 pm, chazzarah was put on hold for a beautiful tisch. With inspiring singing and a d’var Torah from Rabbi Mendelson, everyone felt uplifted and many talmidim returned to the Beis Medrash to continue their chazzarah into the early morning hours. The intense chazzarah continued throughout the entire Shabbos, balanced by lively seudahs, zemiros, and divrei Torah from talmidim and rebbeim, including YU Rosh Yeshiva Rav Yitzchok Cohen, who spoke about the importance of Talmud Torah. Talmidim spent all afternoon in the Beis Medrash, where they enhanced their understanding of all that they had learned in Shiur over the past few months. Shabbos came to a close with a wonderful Seudas Shlishis, featuring divrei chizzuk from Rabbi Neuburger. The entire shiur had an amazing Shabbos and are grateful for the opportunity to spend time with each other and their rebbe in yeshiva.